I'm so proud of my mom. I just have to share this with you all. My father passed away in May 2007. That's my daddy above in Korea during the Vietnam war. 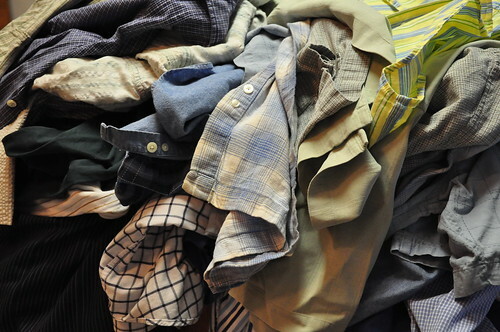 As of last summer, his clothes were still in his closet and my mom asked me to help her go through them. She wasn't quite ready to let them go and had the wonderful idea of making them into a quilt. My mom hadn't made a quilt before, but she's a very talented sewer, cross stitcher, crocheter, and crafter. cut them into large pieces, and tried to sort them out by color and shade. She wanted something simple to construct, so I suggested the blocks above and she started cutting and sewing. And here's the finished quilt! She did such a beautiful job, although I'm not the least bit surprised she did such nice work, I knew she would. I'm so proud of her! The quilt is queen sized and she plans to use it on her bed. 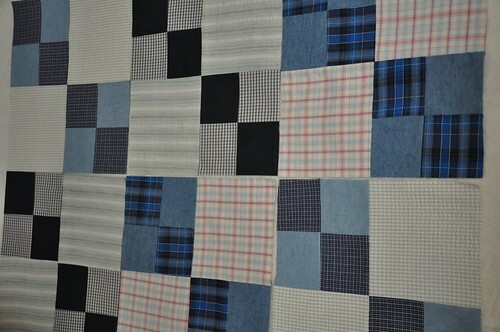 The backing is a purchased sheet in a shirting stripe; it looks perfect for the quilt. 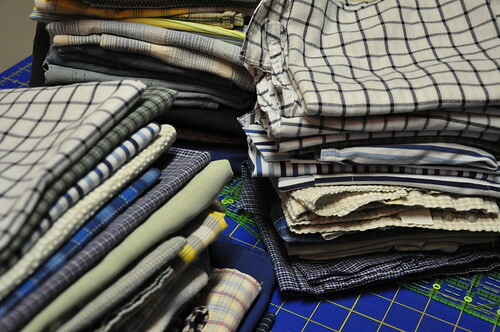 The binding is made of more shirt scraps and is hand sewn. We decided that tying this quilt might be the best option for her because she wanted to do the work herself (I know where I get my stubbornness from) and she didn't want to try quilting a queen on her domestic machine. This quilt is a treasure! It's special and sentimental in so many different ways. I know this quilt will be loved and used for years and years. So, after years of trying to talk my mom into quilting, I suspect this first quilt won't be her last. Between you and me, I think she's hooked. Oh gosh, that brings tears to my eyes. What a wonderful way for her to remember her husband. And what a nice project for you to work on together. It looks fabulous you both must be so proud and what a lovely way to make a lasting memorial to your father. How nice that your Mom used your Dad's clothing for a memory quilt just for her! I like the fact that she didn't "part" with his clothing ASAP like so many people do on losing their spouse. Otherwise, she wouldn't have this nice quilt to enjoy for the rest of her life. Maybe now, she will be inspired to make quilts! What a nice tribute to your father! It must have given your mother some comfort to be working on a project like this during a difficult, and I'm sure lonely, time. What a sweet thought. She will be wrapped up in him everynight. Kudos to your Mom for such a great quilt. I'm sure it was a comfort to her to be able to make something memorable out of his clothing. It's like having a piece of him with her all the time. That is so cool! Great idea! Ohhh!!! How on earth would you not be sooo proud of her? This quilt is a treasure, and will be cherised for ages, take it fr granted! What a great quilt! And how lovely that your mother was able to keep a little bit of your father with her in this way. I'm sure it will become a family heirloom. Great quilt and so very special! Wow...what an inspiration to everyone who has ever lost someone close. The sight, the touch, the smell will surround her with love forever. Thanks for sharing this on Valentines, to remind us all of how precious love can be. Beautiful - the story and the quilt! Thanks for sharing. Beautiful! She did a great job! Probably the most important quilt she will ever make. Just found your blog. I am just a Texan born and raised. Moved to Washington state 19 years ago. I miss Texas but still come home to visit occasionally. I had my family almost raised when we moved to WA. I lived in Lubbock Texas for years raising my children. I am orginally from the panhandle of Texas. Nice blog. I will be reading more of it. Happy Valentines Day to you and your Mom! The quilt is so beautiful and it will give her such warmth. It's beautiful! And such a great daily reminder of your dad. Beautiful!!! Such a good idea, a little bit of him for ever. It's so special that you were able to help her do this. She'll treasure both the quilt and the memory of making it with you, forever. Gorgeous quilt. And with such sentimental memories built into it too, I'm sure. This is so wonderful and I am so happy for her to have this beautiful way of remembering him. My mom died 5 years ago and I have two bags of dresses of hers that I saved with the intention of making them into a quilt. This is good inspiration to get on with it. I'm so sorry for your loss. What an absolutely beautiful piece of art that has a wonderful history and story to go with it too!! What a beautiful quilt. What a beautiful memory. Mom will sleep snug and warm under that quilt. What a beautiful story. She did a great job. Great job on the string quilt in the previous post. Love those blocks. i love the sentiment behind it, absolutely perfect. Beautiful!! What a wonderful tribute to your dad. What a lovely tribute your mother has made to your dad..I can't think of a nicer way for your mom to remember him and how comforted she will be sleeping under that quilt. I think the therapeutic angle of this quilt is what will sustain her interest in this craft. Such a wonderful story, having lost both my parents and only recently starting to quilt, using my mom's sewing machine is as close to a bond as I can get. What a wonderful way to remember not only her husband but your father. Melanie that quilt is beautiful! Your Mom did a great job! She did a beautiful job. It's perfect. Having seen it in person, I know how great it looks! I had no doubts she could do it. What a beautiful memory your mom has created. I can only imagine what crawling under it for the first time felt like. What a wonderful post. 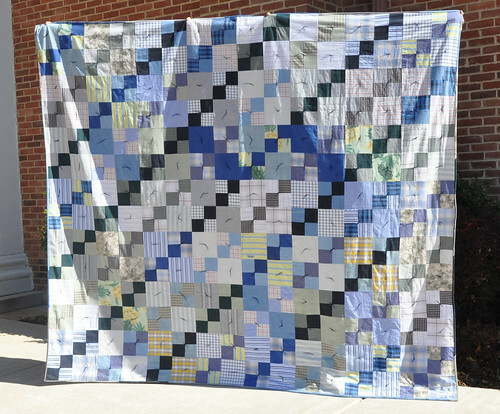 What a beautiful quilt and a wonderful story behind it! Hello Melanie! Your mother made a treasure quilt! It's the most beautiful - I love all the blue colours and the simple pattern! That' so lovely way to have memories of your father around! I like to say also welcome to Luc, who looks adorable! Ps. You make just fantastic quilts! What a wonderful quilt..Im sure it will bring years of comfort to her. I love tied quilts...great job! This quilt i nice and a nice memory quilt. It a great quilt your mom have sewn. What a wonderful way to her to remember her husband. You can be very proud to have such a mom. Have a nice and cozy week. Accidentally stumbled across your blog and your mom's double-4-patch made from your dad's shirts. Lovely! And loving.